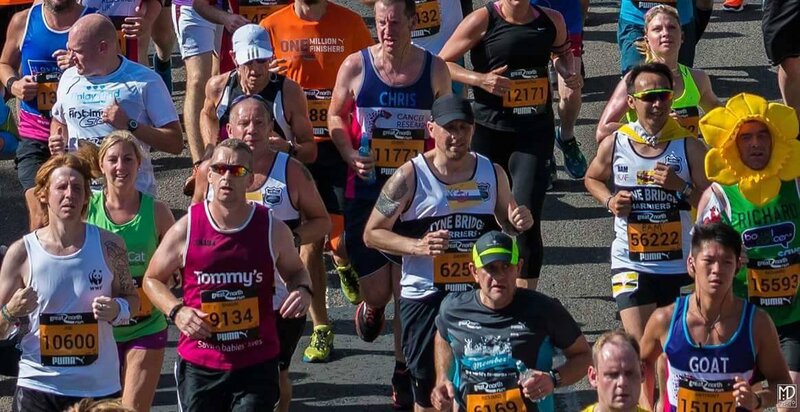 It was watching the Great North Run on television that got me into running, watching people of all shapes and sizes crossing the Tyne Bridge with smiles on their faces on their 13.1 mile jaunt to South Shields. Sadly my love for the run has dwindled since and what once gave me butterflies of joy and excitement now gave me feeling of boredom and woe. This year was going to be different. A group of us had decided that we were going to run together, the sole purpose was to forget about personal bests and it was to soak in the atmosphere of Brendan’s money making machine, and most importantly enjoy ourselves. Shaun Cowan being the top bloke that he is managed to get Bam Rashid a free place, representing Brunei, his last race (for now) in the UK. This race was now going to have an added significance. Myself, Shaun, Ian Walton, Chris Bartlett and Nicola Brady lined up in our pen along with others from the club. Louise Lennox was also going to join us but eating a handful of magic beans her easy run quickly went out of the window and she left us for dust. Bam being classed a VIP was to start at the front with all the other International runners and the elite men. Never one to shy away from the cameras you can see Bam on the television coverage trying to keep up with Mo Farah for the first few metres. We met up with Bam who had pulled over at the first block of portaloos. Stood there with his hands on his hips and the Brunei flag draped around his neck looking like Superman, or should that be Superbam, he joined us with that big smile we have all grown to love. As I say this run was all about enjoyment. Bam ran in front of every television camera we passed and throughout the run we got the crowd to cheer for Brunei. As my head has been focused on racing in the past I have never really noticed the crowds, only really taking them in on the final mile. There really wasn’t a single inch of the entire route that didn’t have somebody along it cheering you on or hands out stretched for a high 5. You can spend money to enter races with the best medals and technical t-shirts but you don’t get this atmosphere at many other races. We lost Chris within the first few miles, we thought he had run off into the distance, but sadly his injury held him back and he finished a good 20 minutes behind us. I do have to be honest though and say It wasn’t the prettiest of sights running behind him as the melting K Tape flapped between his legs. The sun was blaring down on us throughout so water stations became water fights, squirting water at each other from the bottles, much more going over our heads then in our mouths. After last years incident where I made a small child cry by squirting them I refrained from doing that and just aimed at my fellow Tyne Bridge Harriers. Our thirsts were later quenched when we stopped for a beer. Obviously not Bam though, he’s a good lad. It tasted amazing and given the heat it might have been the best beer I have ever had. Running up the John Reid Road we passed Tony Audenshaw (Bob Hope from Emmerdale) who was randomly dressed as Rod Hull, and his emu. Nicola ran alongside for a selfie and Bam had to be part of the photo and tucked in behind. I asked if Seth or Amos were running, sadly they weren’t. No other celebrities were seen that day, well, apart from our very own VIP Bam Rashid. Taking the steep descent onto the sea front Bam decided that he wanted to take my legs from under me, but thankfully I was able prevent the fall and the certain skin grafts I’d have required on my knees. I have always loved this final stretch, the last mile or so jam packed with spectators with their home made signs. 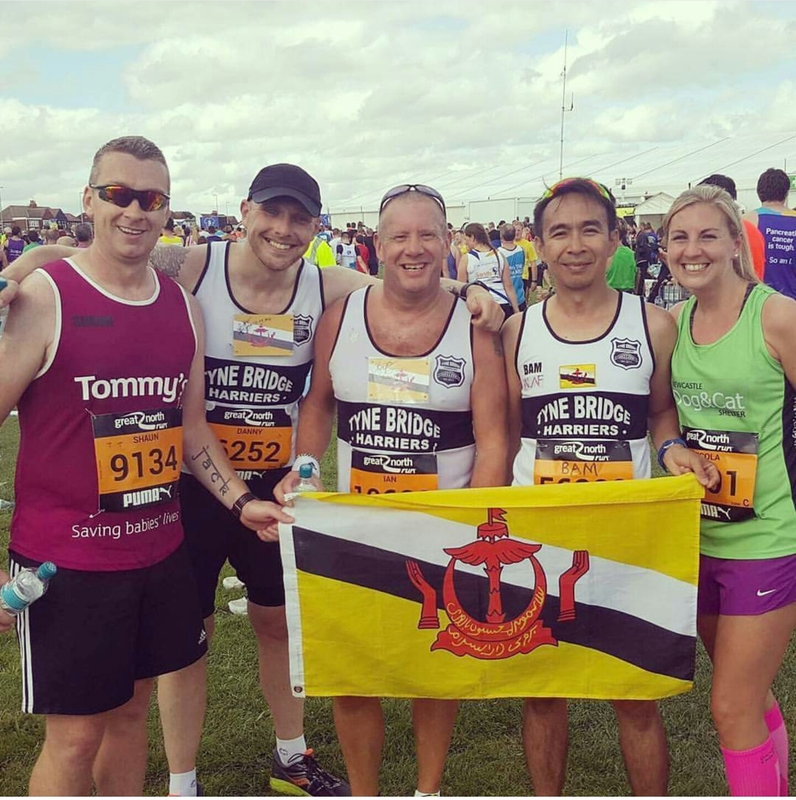 More cheers for Brunei and the Tyne Bridge Harriers flag greeted us. In the distance we caught sight of Derek Vardy who was hoping to get a Sub 2hr PB. He was well under this time, but it didn’t stop us from shouting his name over and over. I’m not sure if he picked up the pace to cement his time or to get away from us. I think its safe to go with the latter. Yes, we moan at the cost, but I’d sooner pay £50+ for an experience that I will never forget than a night on the drink where I have nothing to show for it other than a hangover. Its not a run to race, its a run to feel. This years run has definitely rekindled my love of the event. None of us were near a personal best time, but we all shared friendship, laughter and tears. Mission accomplished.